Rain today and 49 degrees. 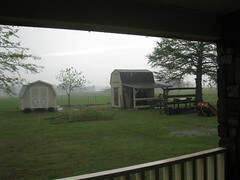 Although a day late, I suppose the rain counts as an April shower. We'll take it, especially if the rain waters the wheat land in western Oklahoma. 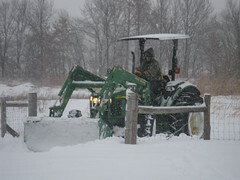 This has been a year of wierd weather so far, starting with record cold and snow. Remember the days of the white stuff? Then came a dry stretch that continued the winter drought and put us woefully behind on rainfall. With the dry, came record hot days and constant wind that fed firestorms across the state. 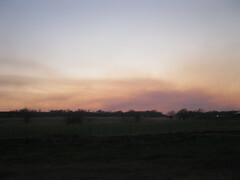 Smoke from the numerous grass fires added haze to the horizon and red to the sunsets. we caught up on our rainfall allowance in a hurry, some areas received 15 inches from a single storm. That caused river runs at 25 feet over flood stage and put lake campgrounds underwater. 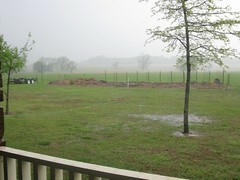 My waterlogged garden can be seen in that last photo. I started the tomato seeds for my garden just before January's snowstorms. I'd bought little greenhouses and heat pads from an Internet company last December. Since the snow outside kept our sunroom colder than I liked, the plants stayed inside the house under CFL lamps. I got the idea for the grow lamps from the Internet, putting my spin on the design so I could use the parts I had on hand After you've built a house, you have plenty of miscellaneous spare and useful parts, especially if you're like me and hate to throw good stuff away. While I was planting tomato seeds, I also planted seeds for Jalapeno peppers, and tomatillas. I've never grown tomatillas before. 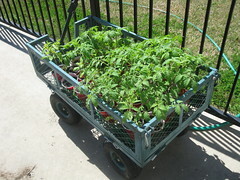 When the weather warmed and the plants were big enough, I set them outside i a wagon. 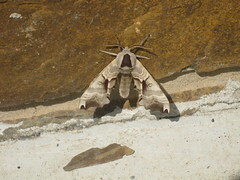 I have the plants in the garden now along with zuchina plants. I'll add two egg plants and a row of okra later. Once we started getting rainfall, our asparagus bed started producing. The chopped ham, fresh asparagus, and egg breakfast taco I had this morning was delicious. The good news is our strawberry and blueberry plants didn't freeze out last winter. 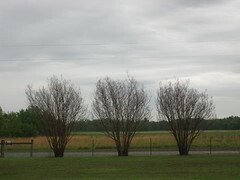 I can't say that about our crepe myrtle. Even our three big ones died down to the roots. 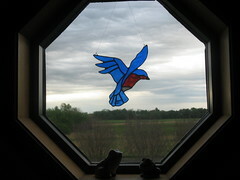 I end with two photos, the first is of a moth I'd never seen before, a Pandora Sphinx, and the second is of a stained glass suncatcher, a bluebird, handcrafted by Kathy years ago.